This study day is designed to offer practising midwives first class continuing professional development that also provides essential hours towards revalidation. In addition, through the chance to discuss and work with other professionals during the course of the day, delegates will be able to address many of the key components of revalidation through reflective discussion. The study day will also point delegates to other resources which can be accessed online or face to face to not only complete your statutory requirements for revalidation but give you first class clinical and practice insight into midwifery. Through this event and with the follow up materials and interactions delegates will be able to cover the 20 hours’ activity that midwives need to be able to demonstrate for revalidation purposes. 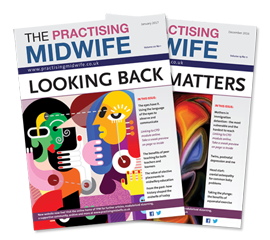 All participants will receive a free, one year subscription to The Practising Midwife – the new online community and learning zone to develop, prepare and share practice. (Existing subscribers will receive a free extension to their subscription). Dr Gloria Esegbona, Strategic Clinician, academic and educator skilled in high risk intrapartum care and with specialist experience in prevention and management of a wide range of obstetric trauma, including the obstetric fistula.